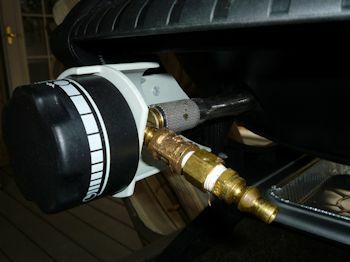 In May I purchased from Lowe's a portable gas grill that I can connect to the quick connect connection on my 2013 Shadow Cruiser 225 RBS. All I need is the correct size fitting for the grill to connect to the quick connect on the camper. I spoke to a Camping World rep and purchased one however when I received the part it was not the right size. I contacted my dealer and they said they tried all the connections that they had on a Shadow Cruiser on their lot and none fit so they would contact Cruiser RV for the correct part. I hadn't heard from them in a few weeks so I called Cruiser RV myself and was told the part number that I would need but they would only sell to a dealer. I've contacted my dealer twice since they claim to have ordered the part from Cruiser RV and it has yet to come. There was a month between my phone calls to my dealer so it certainly should have come by now. I was wondering if anyone knows what size connection I need and where I might be able to purchase it? I got mine on amazon and a 10 ft extension hose Make sure you get a low pressure lp fitting . Mine fits perfect. Also make sure you use yellow Teflon tape and if your grill has a regulator remove it. The fittings are all low pressure Sturgis style 250 units. 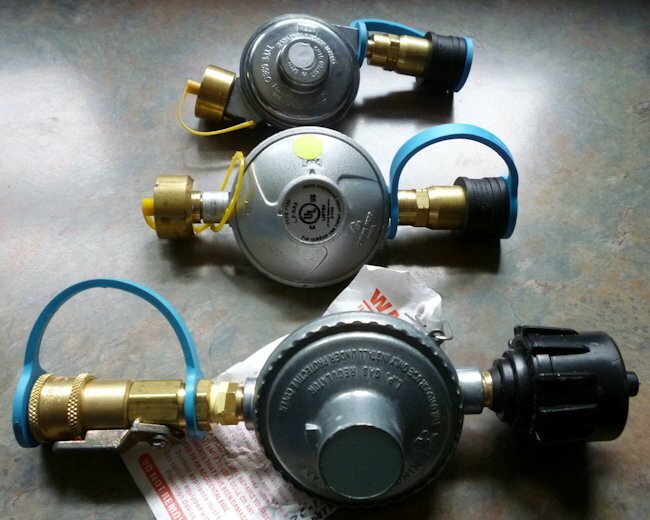 Most of the fittings that CW and other places sell are for the Mr. Heater units and they are not interchangeable, even though they look alike, at first glance. In fact there are many "quick connect" pieces that are "look alike", but, are meant for different purposes; air, high pressure LP, low pressure NG, high pressure NG, etc. and they are all slightly different so that you can't mistakenly use the wrong fittings together (explosive leaks can result). I also modified some regulators so that if I want to, I can still use the grill with a tank; in fact I modified 2 regulators so that I can not only use the little 1 lb tanks it was intended for, I can use a 20 lb tank (handy for use at the sticks and bricks when I need more grilling space for parties). All of it done with pieces from Calore, including my collection of hoses. Even made up a quick connect "T" so that I can run the grill and my Campfire-in-a-Can at the same time. To be sure, you want to use yellow gas tape and not the white water tape to seal the threads. If you use a paste compound, again, make sure that it is rated for gas use and not just water. I went down to my local Sears Hardware and bought some fittings to convert it from the 1/4" to the 3/8" quick connect. Works great. 2014 Dodge Ram 2500 AT 4X4 Crew Cab 6.4 L Hemi, 373 gears, tow package, Rambox option, Revolver X2 tonneau cover, Equal-I-zer anti-sway hitch. do you have a parts list for this conversion, right now using the hose from the trailer to grill, but going thru both regulators, will have to buy a new hose a mine has the fitting that screws in the grill. and can seem to find any adapter from that to 1/4 inch.